Varroa mites may be mighty small – about the size of the head of a pin – but the parasites are a primary cause of colony collapse disorder, a large problem for honey bee populations worldwide. A study published in the Proceedings of the National Academy of Sciences today debunks the long-held belief that the mites feed on "bee blood" – AKA hemolymph. NC State entomologist Allen Cohen, a co-author on the PNAS paper, wasn't surprised by the study's results. For years, he's contended that the mites' digestive system and the content of their excrement point to another, denser food source. Samuel Ramsey and his University of Maryland colleagues found that Cohen was right. Conducting the research as part of his doctoral studies under Professor Dennis vanEngelsdorp, Ramsey determined that instead of drinking hemolymph, the mites consume the bees' fat body, an organ that stores and uses nutrients as they are needed. 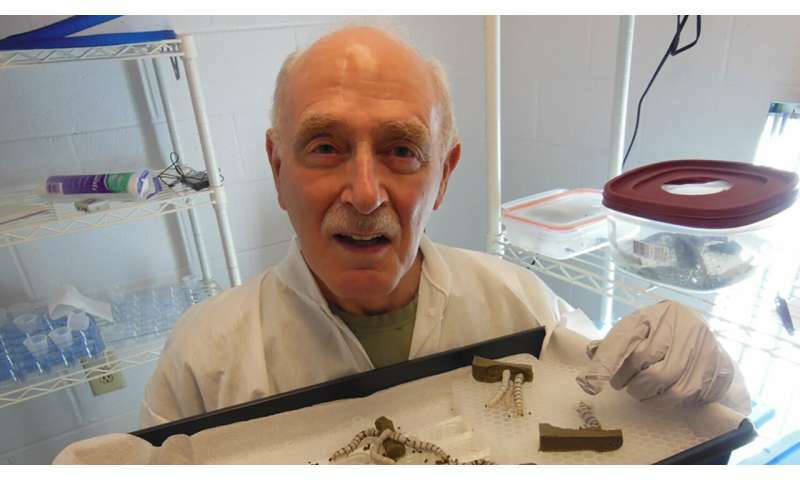 Cohen has been studying insects and arachnids for more than 40 years, first for the U.S. Department of Agriculture and then as a researcher in NC State's Department of Entomology and Plant Pathology. Cohen, who's with the department's Insect Rearing Education and Research Lab, has literally written the book on the science and technology related to artificial insect diets. Cohen's work with scores of arthropod species led him to believe that insect predators use powerful enzymes that they pump into their prey with their straw-like mouthparts to turn the pests' insides into mush, then extract and digest the slurry. Cohen says he got the idea after his jaw was broken in a fight. With his jaw sewn shut, he couldn't eat solid food, so instead he sipped liquids – including milkshakes and eggnog—through a straw. Despite the high-calorie drinks, he lost weight and always felt hungry. "I realized that neither man nor predatory insects can live by eggnog alone," he quips. "I was trying to give insects the same thing that I was not thriving on – liquids—and that was failing: The insects would sooner die than eat the foods that I was giving them." The idea that predatory insects use extra-oral digestion led Cohen to publish a paper in the Annual Review of Entomology in 1995. Around the same time, he co-authored an article with the late E.H. Erickson on white spots that showed up in beehives infested with varroa mites. They determined that the spots were the mites' excrement, and Cohen believed that the spots were too thick and pasty to be the result of consuming hemolymph. Cohen calls Ramsey's findings "spectacular," illustrating a principle Cohen shares with students taking his insect-rearing classes. "If you know what the insect mouthparts are like and its digestive system," he says, "and if you know what the waste materials are like, then that'll tell you what the insects eat."